Analysis of signal transduction and protein phosphorylation is fundamental to understand physiological and pathological cell behavior as well as identification of novel therapeutic targets. 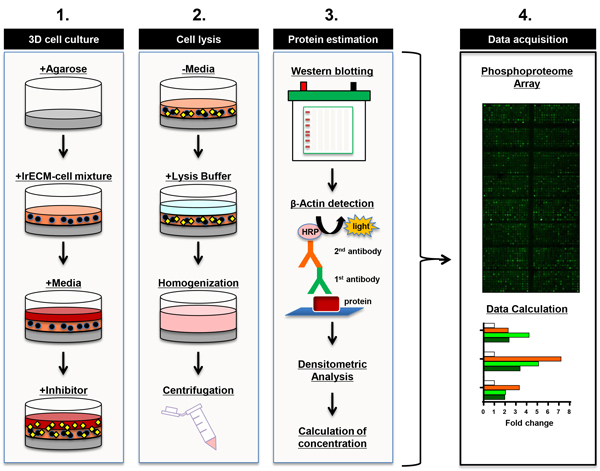 Despite the fact that more physiological three-dimensional cell culture assays are increasingly used, particularly proteomics and phosphoproteomics remain challenging due to easy, robust and reproducible sample preparation. Here, we present an easy-to-perform, reliable and time-efficient method for the production of 3D cell lysates without compromising cell adhesion before cell lysis. The samples can be used for Western blotting as well as phosphoproteome array technology. This technique would be of interest for researchers working in all fields of biology and drug development.